Today starts the Holiday Extravaganza Excitement. Stampin’ Up!’s annual Black Friday Sale. This year it will play out a little different. 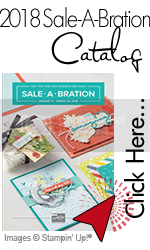 You will have the opportunity to purchase dozens of products from the annual catalog at a savings. Stock up on the products you want to add to your craft room. There will be different products to choose from every 48 hours. Stamp sets, cardtsock, accessories and embellishments among others. Below is all the information, so please read carefully because there are three different sales in six days. But remember, the first one starts today. Online Extravaganza is a six day sale with three different sales. See below for all the information on how it breaks down. During the six days, we’ll offer three, 48-hour sales featuring a selection of products from the 2018-2019 annual catalog and all will be at 10% off! Also, each 48-hour sale will feature two product categories (e.g., paper, stamps, ink, etc.). So, when one sale ends, the next sale begins; this cycle will continue until Online Extravaganza is over. By the end, nearly every item from the annual catalog will have been on sale! Please be aware, all items are limited quantity and will no longer be available once they sell out. Finally, enjoy your Black Friday shopping! Happy Thanksgiving.